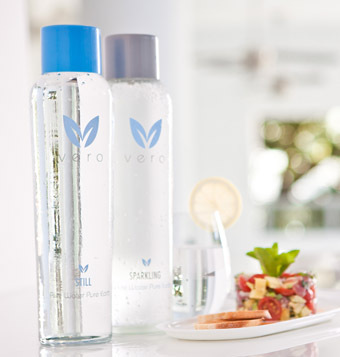 Our commitment to developing the best in water filtration and bottling technologies has made Vero Water® the leading provider of Still and Sparkling water to the hospitality industry. Our unmatched taste makes us the water of choice in many of the world’s finest hotels and dining establishments, with industry leading hotel operators like Ritz Carlton Hotels & Resorts, Hyatt Regency Hotels and MGM Resorts International, as well as at award-winning culinary destinations headed by chefs such as Mario Batali, Michael White, Emeril Lagasse, Marc Forgioni and many others. Dedicated to providing the best possible customer service around the clock, Vero Water has quickly become the go-to water solution for the hospitality industry. In fact, in 2011, Vero was featured in the NASDAQ Next Great Consumer Brands Showcase. Vero Water® has quickly become the go-to water solution for the hospitality industry. An ample supply of our Vero Still and Vero Sparkling one-litre bottles are provided with the system. They have been specially designed for reuse and simple cleaning, durable enough to withstand daily washing in industrial dishwashers. A specially designed, machine-washable plastic bottle is also available for poolside service. The Vero Water® bottling system is available for monthly lease with all maintenance and filter changes included for one low price, regardless of the amount of water consumed. 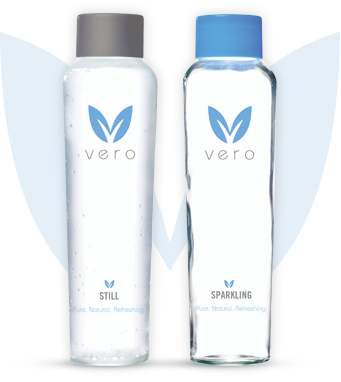 Call 01953 857975 today to learn more about serving Vero Water® at your establishment.